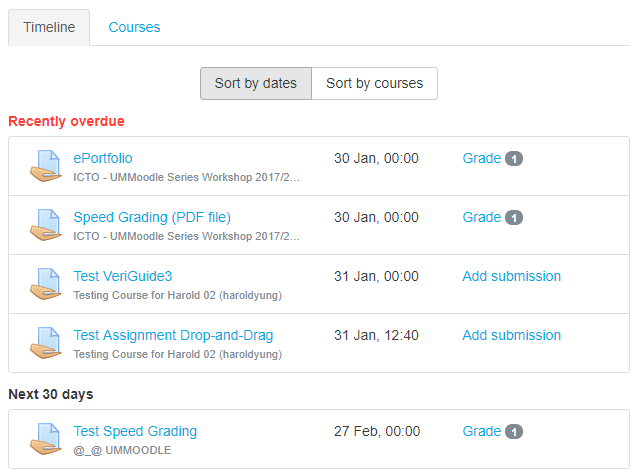 The course overview block is improved to enable students to check course progress and view upcoming deadlines. And it allows teachers to easily see the activities require grading. In Course tab, courses are classified in three sections ‘Past’, ‘In Progress’ and ‘Future’. ‘In Progress’ section: The courses must be on at the present date and the current date must be after the course commencement date. The current date must be before the end date, or there is no end date. ‘Future’ section: The course start date is in the future. ‘Past’ section: The course end date must be in the past or the course must have been completed. Remark: Since the end date of newly created course or empty course must be same as the start date, all new created courses or empty courses will be classified to ‘Past’ section. The Timeline tab can be sorted by date or by courses. Students can click to go directly to a required item – for example, ‘Add submission’ to submit an assignment. A course teacher has a similar view to that of a student. Additionally, teachers are alerted when assignments need grading. The number needed grading displays for teachers and they can click the ‘Grade’ link to go directly to the grading screen. Speed Grading means using the feature annotating submissions in Assignment activity. If the student has uploaded a PDF, docx or odt file, then their submission will be displayed on the grading screen, allowing teacher to annotate it, using a variety of tools, stamps and comments which may be stored in comments bank. When the annotations are complete, clicking to save the changes. It will result in it being displayed to the student as part of their feedback. In order to let our users be more familiar with UMMoodle, ICTO arranged a series of workshop for users which will be guided by tutors with hand-on practice. For detailed information, please refer to our E-Bulletin.